Start in "Talking Rock" Georgia (just northwest of Jasper, GA) and head east on Georgia Route 136 ... PAY ATTENTION to the signs to stay on 136 through the next 5 miles or so! Once you make the left at the "T" at Burnt Mountain Road, you can relax and enjoy the ride for the next 15 miles througt the mountains. In Dawson county, you will need to make a right at another "T", then bear off to the left to follow 136. In about 5 miles, you will come to a 4-way stop at Hwy. 9, and you can go left to Dahlonega, but I recommend going another 4 miles or so to Auraria Road, a left turn just as you come into sight of GA 400. this parallels 9 and 400, and I consider it the most scenic route, though it doesn't have the curves of 9. Good pavement without any significant rough spots. Curves are sweeping, not twisty. Grade is significant in spots, but no problem for most motorcycles. Overall, the grades make this a challenging drive for most 4-wheeled vehicles, but is a good leisurely ride on two. You seldom encounter much in the way of traffic. Not much as far as stores once you leave Talking Rock, until you get to Dawson County. Nice Scenic turnout about 10 miles in. on June 9, 2013 0 out of 0 members found this review useful. on December 29, 2011 0 out of 0 members found this review useful. Very enjoyable ride for the most part. Strange to go from 55 and then in the mountains seeing snow just feet from you. Word of caution on this run right now is that there was a lot of gravel on the roads and with the curves could be dangerous so just keep your eyes open and ride safely. I'm looking forward to running this again when the weather warms up. I just moved into GA and chose this for my first ride. The prior reviews are correct. The scenery is beautiful but very little in terms of places to stop for gas so make sure you're full before you begin. I don't know if it is because of the time of year but there was a lot of gravel on the roads in the mountain curves which you had to watch out for. Just ride it safe and take your time and you'll be fine. The road really don't have much in terms of traffic at leas that I saw. I loved it and will ride it again when it gets warmer. on September 12, 2011 0 out of 0 members found this review useful. Made this run Sept 3, 2011. Please make sure you fill up at the QTrip before beginning this route located on Hwy 575. There are not to many places to refuel once you begin. While on 136 you will come to a fork in the road where 136 is to the left and 83 is to the right. we were looking for fuel and thought the gas station (texaco) was open but it wasn't and got back on route not paying attention and ended up on 83. But don't worry it will take you back across 136/9 once you reach Dawsonville. You can refuel at several places once you reach the small town and be good to go. there were several places you can pull off to get some good pics on the scenery. 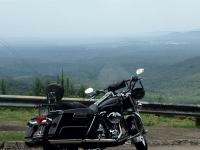 I will definitely do this route again in the fall..
One of my favorite rides. Great views with enough turns and elevation changes to keep me interested. Very little traffic most of the time. My only complaint is that the road doesn't keep going. on May 27, 2008 0 out of 0 members found this review useful. Ran the 136 yesterday, nice ride through farm land and mountains. Very little traffic. A couple of hard truns but well marked and really not much of a problem. A very nice ride.